The main purpose of a tutor is to help his or her students help themselves. In other words, tutors offer guidance and support for students to do their best. 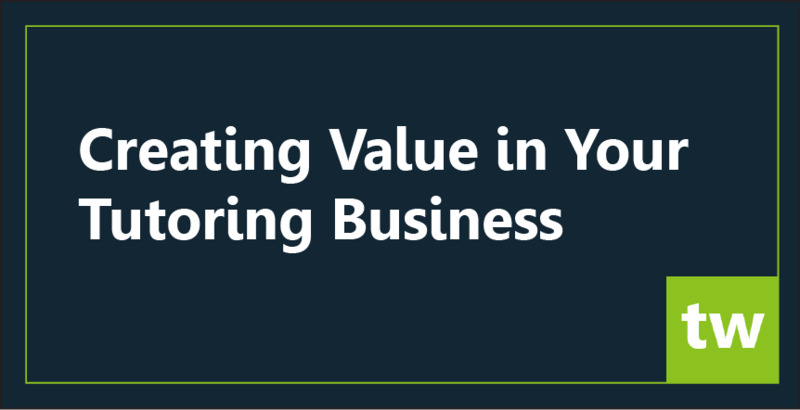 Since tutoring is not a tangible product that could be explained by highlighting particular features, sometimes it might be challenging to explain the value your tutoring business offers. Let’s face it – tutors are very passionate about their profession, they take pride in helping their students achieve their goals. This is probably one of the main reasons you decided to start your own company – to help more students. Finding 3 qualities that best describe you and your team can help you build your brand around what best represents your company as a whole. These qualities can then be used in your marketing efforts to tell your customers what you and your team of tutors stand for. The services your tutoring business provides, goes way beyond the scope of the subjects your tutors teach. For example, your business plays an important role in selecting the best tutors for students. The tutor selection process helps build confidence in your business and helps parents avoid doing all the research, screening and interviewing work themselves. You know it takes hard work to build your tutoring business reputation. This is why you make sure the tutors you select for your business are qualified and dependable before they serve your clients. Making emphasis on the tutor selection and recruitment process helps parents determine the suitability of the tutors for their children and builds trust in your company. By hiring a tutoring company, parents will be investing in tutors that are 100% focused on the student’s abilities and progression rather than administrative tasks and other business activities. You provide support to your tutors and handle administration, student payments, and other business activities, so they can focus on providing students with the best tutoring sessions. This an important aspect to mention, especially when competing against independent tutors. Your company is the backbone of the relationship between the tutor and the student. The supports systems you have in place strengthen this relationship. For example, when a tutor is not able to attend a lesson, rather than interrupting the student’s sessions you can pair this student with another qualified tutor. On the tutor’s end, the support comes in guidance on how to conduct their sessions and resources on teaching techniques and procedures they can learn from within your company. It is easy to get caught in the day-to-day activities and forget to let your customers know about the small details that make your company unique and special. We hope this article reminded you of the intangible values your company brings to the tutoring world.